(Nanowerk News) While a classical bit found in conventional electronics exists only in binary 1 or 0 states, the more resourceful quantum bit, or 'qubit' is represented by a vector, pointing to a simultaneous combination of the 1 and 0 states. To fully implement a qubit, it is necessary to control the direction of this qubit's vector, which is generally done using fine-tuned and noise-isolated procedures. Researchers at the University of Chicago's Institute for Molecular Engineering and the University of Konstanz have demonstrated the ability to generate a quantum logic operation, or rotation of the qubit, that - surprisingly -- is intrinsically resilient to noise as well as to variations in the strength or duration of the control. Their achievement is based on a geometric concept known as the Berry phase and is implemented through entirely optical means within a single electronic spin in diamond. Their findings were published online Feb. 15, 2016, in Nature Photonics ("Optical manipulation of the Berry phase in a solid-state spin qubit") and will appear in the March print issue. "We tend to view quantum operations as very fragile and susceptible to noise, especially when compared to conventional electronics," remarked David Awschalom, the Liew Family Professor of Molecular Engineering and senior scientist at Argonne National Laboratory, who led the research. "In contrast, our approach shows incredible resilience to external influences and fulfills a key requirement for any practical quantum technology." When a quantum mechanical object, such as an electron, is cycled along some loop, it retains a memory of the path that it travelled, the Berry phase. To better understand this concept, the Foucault pendulum, a common staple of science museums helps to give some intuition. A pendulum, like those in a grandfather clock, typically oscillates back and forth within a fixed plane. However, a Foucault pendulum oscillates along a plane that gradually rotates over the course of a day due to Earth's rotation, and in turn knocks over a series of pins encircling the pendulum. The number of knocked-over pins is a direct measure of the total angular shift of the pendulum's oscillation plane, its acquired geometric phase. Essentially, this shift is directly related to the location of the pendulum on Earth's surface as the rotation of Earth transports the pendulum along a specific closed path, its circle of latitude. While this angular shift depends on the particular path traveled, Awschalom said, it remarkably does not depend on the rotational speed of Earth or the oscillation frequency of the pendulum. "Likewise, the Berry phase is a similar path-dependent rotation of the internal state of a quantum system, and it shows promise in quantum information processing as a robust means to manipulate qubit states," he said. In this experiment, the researchers manipulated the Berry phase of a quantum state within a nitrogen-vacancy (NV) center, an atomic-scale defect in diamond. Over the past decade and a half, its electronic spin state has garnered great interest as a potential qubit. In their experiments, the team members developed a method with which to draw paths for this defect's spin by varying the applied laser light. To demonstrate Berry phase, they traced loops similar to that of a tangerine slice within the quantum space of all of the potential combinations of spin states. "Essentially, the area of the tangerine slice's peel that we drew dictated the amount of Berry phase that we were able to accumulate," said Christopher Yale, a postdoctoral scholar in Awschalom's laboratory, and one of the co-lead authors of the project. This approach using laser light to fully control the path of the electronic spin is in contrast to more common techniques that control the NV center spin, through the application of microwave fields. Such an approach may one day be useful in developing photonic networks of these defects, linked and controlled entirely by light, as a way to both process and transmit quantum information. A key feature of Berry phase that makes it a robust quantum logic operation is its resilience to noise sources. To test the robustness of their Berry phase operations, the researchers intentionally added noise to the laser light controlling the path. As a result, the spin state would travel along its intended path in an erratic fashion. However, as long as the total area of the path remained the same, so did the Berry phase that they measured. "In particular, we found the Berry phase to be insensitive to fluctuations in the intensity of the laser. Noise like this is normally a bane for quantum control," said Brian Zhou, a postdoctoral scholar in the group, and co-lead author. "Imagine you're hiking along the shore of a lake, and even though you continually leave the path to go take pictures, you eventually finish hiking around the lake," said F. Joseph Heremans, co-lead author, and now a staff scientist at Argonne National Laboratory. "You've still hiked the entire loop regardless of the bizarre path you took, and so the area enclosed remains virtually the same." 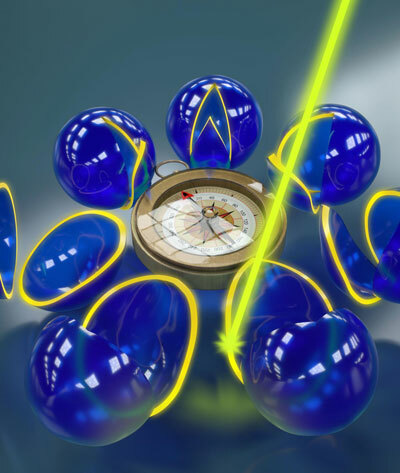 These optically controlled Berry phases within diamond suggest a route toward robust and fault-tolerant quantum information processing, noted Guido Burkard, professor of physics at the University of Konstanz and theory collaborator on the project. "Though its technological applications are still nascent, Berry phases have a rich underlying mathematical framework that makes them a fascinating area of study," Burkard said.